Part of our mission at SparkFun Education is to provide technology educators with the foundational tools they need to succeed in the world of maker education and electronics. In addition to focusing on key content, we will provide time to reflect on pedagogy, classroom management, and pacing of material. 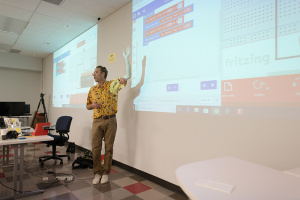 This class is designed to provide a basic foundation to start working with students in the context of programming, engineering and computational thinking. We have run through this class with a wide range of educators from K - 12 and beyond. Teachers will understand the basics behind electricity and circuits as well as how to teach these topics. 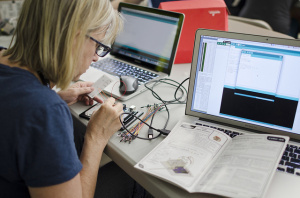 Teachers will have a general fluency and literacy with programming in C/C++, Arduino, and Processing. 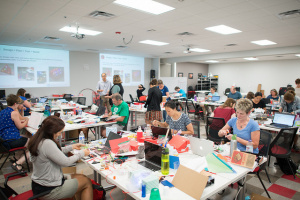 Collectively, we will develop a set of lesson plans, activities, and projects to use in the classroom that integrate microcontrollers, programming, and electronics. Some of the tools we will use include the Processing programming language, the SparkFun Inventor’s Kit for Arduino and the SparkFun RedBot robotics platform. Note: Please install the Arduino 1.8.5 (or the latest available version) software on your computer before class. Click here for instructions on installing the Arduino software. In addition, please install Processing and Fritzing as well. We will go into more depth for how we use these free and open-source tools in the classroom. Professional Development Credit This class is good for 3.0 graduate credit hours through Colorado State University continuing education with an additional payment to be collected at the time of the class. Paperwork for credit will be available during the first and second day of class. 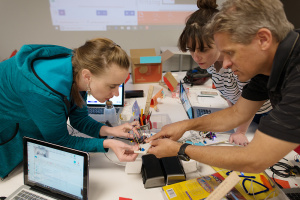 Prerequisites: This class is exclusively for instructors and educators who want to learn how to implement physical computing, programming and electronics into their classroom. 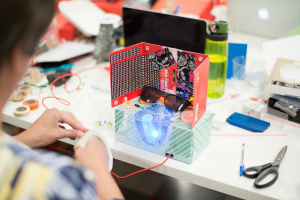 There are no prerequisites for this class, however, the class requires that participants have the physical dexterity to insert wires into a breadboard (the physical equivalent of inserting shoelaces into the holes of sneakers). What to bring: Please bring a laptop (including all administrative privileges and passwords) and ideas about what a STEM classroom looks like for you. We will explore these ideas throughout the week. If you do not have a laptop, SparkFun laptops will be available on a first come, first served basis. Cost: $1000 per participant (includes more than $400 worth of take-home classroom hardware). A 10% refund will be given to groups of 3 or more who register together. We will NOT accept walk-ins for this class, only registered participants will be accepted. Thank you for understanding! Note: Class registration is fully refundable until the weekday (M-F) prior to the class at 5:00pm MST. Please call to do so. 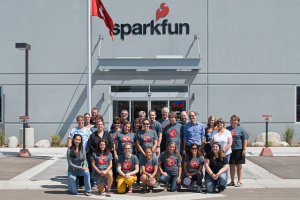 If you wish to cancel after that time, or miss the workshop for any reason, we will transfer the amount you paid to SparkFun store credit, but cannot issue refunds. Thanks for your understanding!